Cuenca is a city in Castile La Mancha. It is the capital of the province of Cuenca and is located in central Spain, to the east of Madrid. Cuenca is a small, historic city. The original fortified settlement was built by the Moors in the 8th century. 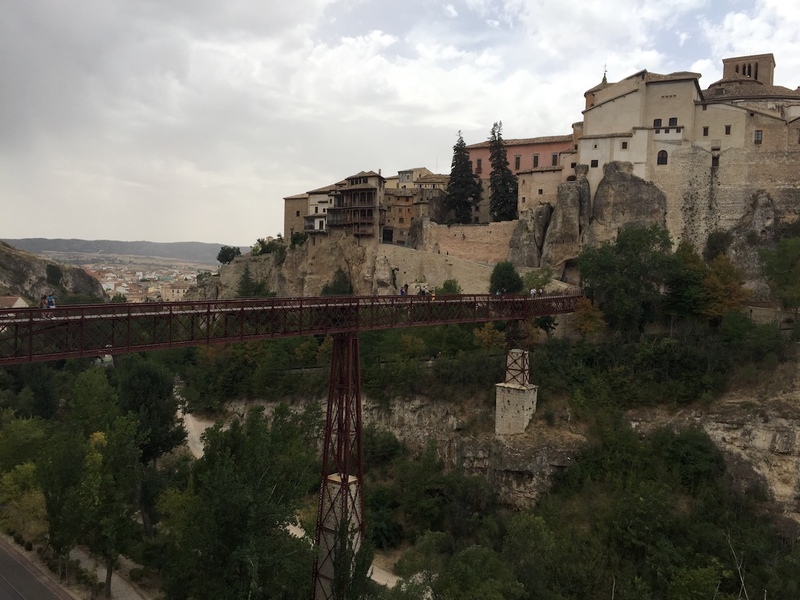 The Júcar and Huécar rivers created deep gorges and the old city of Cuenca sits atop. The situation makes for dramatic visuals and impressive architecture. Cuenca is a UNESCO World Heritage site. The modern city is located to the south of the old town, and whilst there are many nice bars and restaurants in the new part, the majority of visitors concentrate their time in the old town. The old town of Cuenca is pretty compact. However, you need to be reasonably fit to explore at length, as you will find many slopes and steps to navigate. There are a number of museums and historic buildings to visit, ranging from modern art, local history to modern science, ensuring their is something for everyone. La Catedral de Cuenca (http://www.catedralcuenca.es/inicio) located on the Plaza mayor is Cuenca´s old town. The hugely impressive facade is a fitting introduction to the unique interior of this 12th century Cathedral. The original Gothic style has mixed with later Norman influence. It really is a must see when visiting the city. There is an entrance fee payable of around €4.00. The opening hours are 10.00 am to 7.30 pm. Visitors benefit from a very good audio guide, in a range of languages. The guide utilises numbered points around the Cathedral to provide detailed descriptions as you tour the building. The Museo Tesoro Catedral (https://museodiocesanocuenca.jimdo.com) is housed in the adjoining building to the Cathedral and provides further religious history and a significant collection of artefacts. Puente de San Pablo (Bridge of Saint Paul). This very well photographed bridge crosses the gorge of the river Huécar. The bridge was originally built in the 16th century in order to link the town with the convent of Saint Paul of the other side of the gorge. The convent is now the Parador hotel. If, like we did; you stay at the Parador, you will find yourself crossing the bridge several times per day and it is not for the faint hearted! El Castillo. 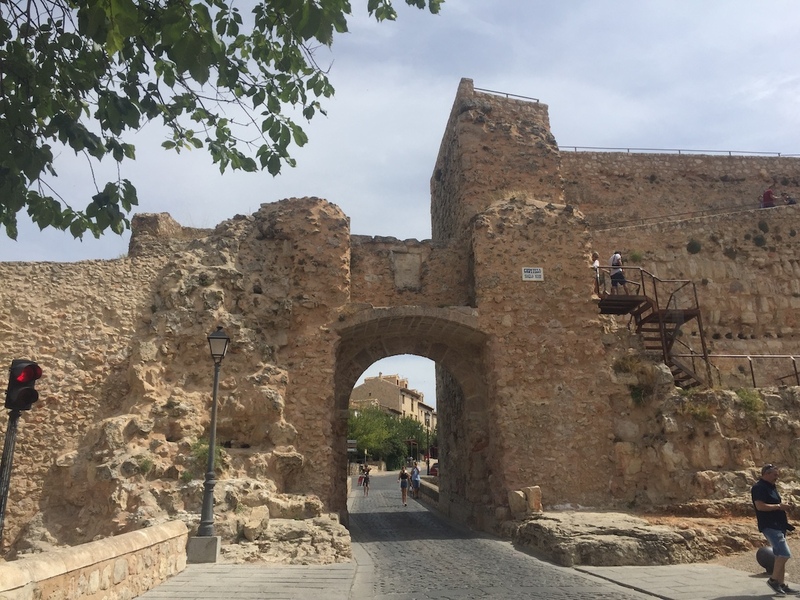 If you continue up the hill from the Plaza Mayor you will eventually reach the remains of the Arab fortress, which is now referred to as the castle. Visitors are able to climb the remaining walls and go through the archway over the road. The views are impressive over towards the Parador and beyond. Museo de Arte Abstracto Español (https://www.march.es/arte/cuenca/?l=2) This museum of modern art is housed in the famous Casa Colgadas (see more below). The museum displays a range of art by Spanish artists from the 20th century. The interior of the building has undergone extensive sympathetic restoration. Casas Colgadas (Hanging Houses). 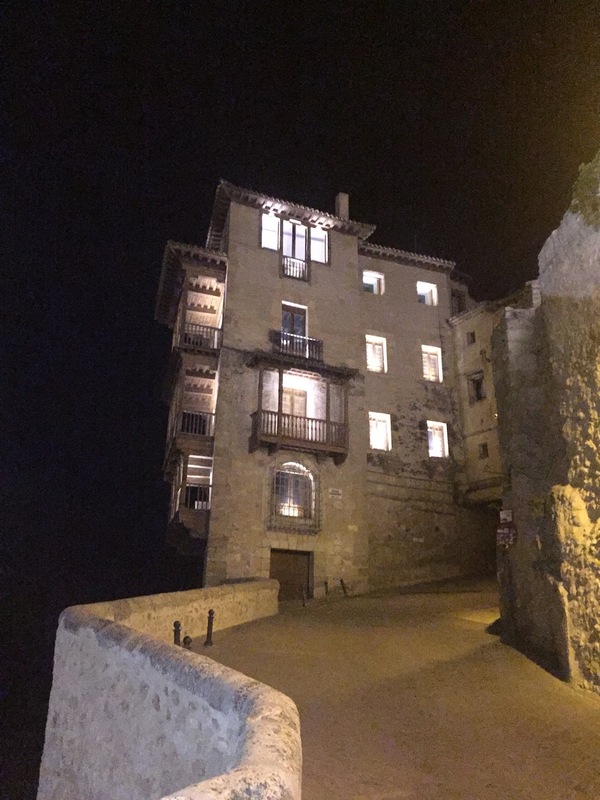 These famous medieval houses date from the 15th century and have somehow clung to the rock face for centuries. Crossing the bridge provides ample photo opportunities. The Museo de Arte Abstracto now occupies a large part of the building. Even if you are not interested in art, it is worthwhile entering to see the interior renovation and also to get a glimpse of the external terraces close up. Museo de Cuenca (Museum of Archaeology). This small museum houses a range of Roman artefacts from the local area. Mangana Tower. The tower dates from at least the 16th century and could perhaps be older. The tower affords impressive views on all sides. 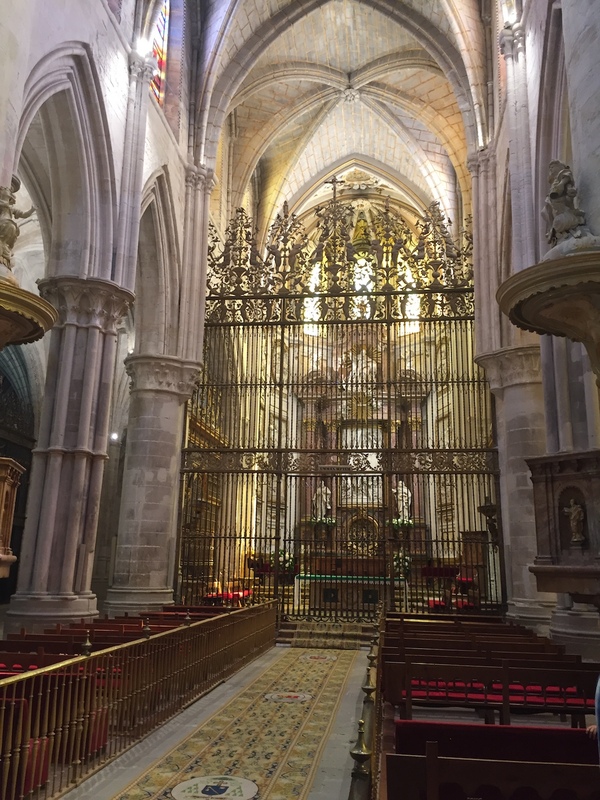 It is located just a 5 minute walk from the Plaza Mayor. El Ayuntamiento (Town Hall). The town hall dates from the 18th century and is located at the bottom of the Plaza Mayor. The 3 arches form a fantastic entrance to the plaza. Museum of Science of Castile-La Mancha (http://pagina.jccm.es/museociencias/) This museum is located very close to the Plaza Mayor. 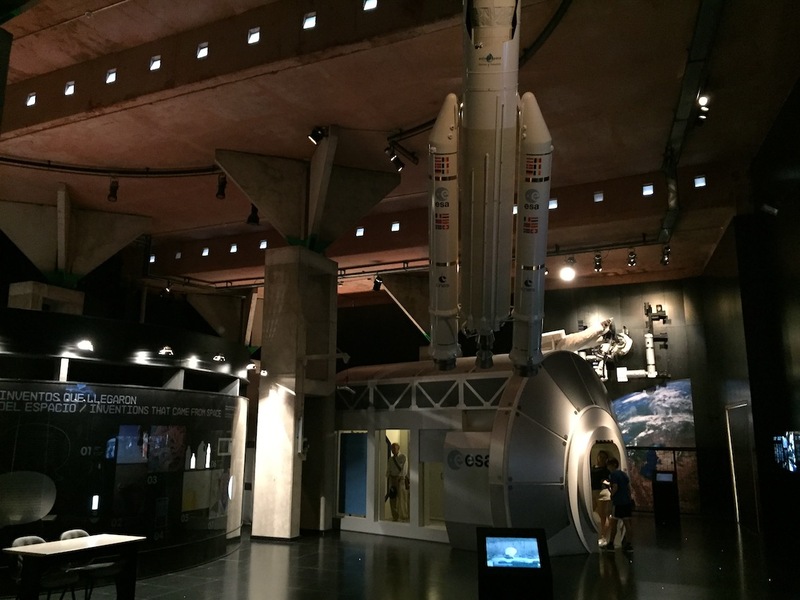 It is well worth a visit as the museum would not be out of place in a major city, with a range of interactive displays covering a wide scope of subjects. Opening times Tuesday to Saturday 10.00 am to 2.00pm and 4.00 pm to 7.00 pm; Sunday 10.00 am to 2.00 pm; closed on Mondays. Opportunity for outdoor activities in the area are plentiful. In the surrounding countryside there are many excellent hiking and cycling routes. You can also learn to kayak along the river. Cuenca is a city with a rich variety of traditional festivities and entertainment throughout the year. The Easter week (Semana Santa) is one of the highlights of the year. The old town witnesses a number of processions and a range of events throughout the week. The Festival of San Julián is held at the end of August each year. The festival usually lasts 10 days and is held at various locations and venues throughout the city. The events are varied and include bullfights, theatre productions, parades, concerts, sporting events etc. The Festival of San Mateo takes place on 21st September and celebrates the conquest of the city. The festival highlights are the transfer of a banner between the cathedral and the town hall and the running of young bulls through the cobbled streets of the old town to the Plaza Mayor. 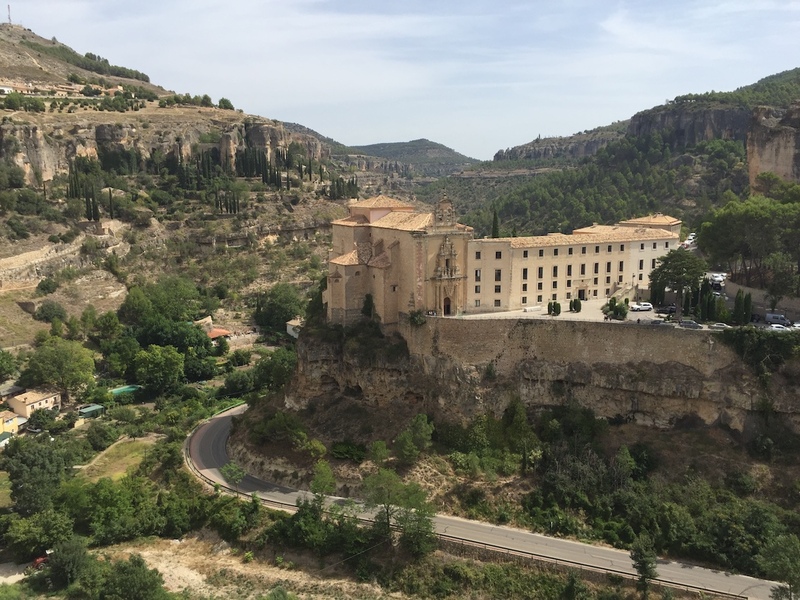 La Vuelta, the famous cycle race around Spain, frequently passes through Cuenca. 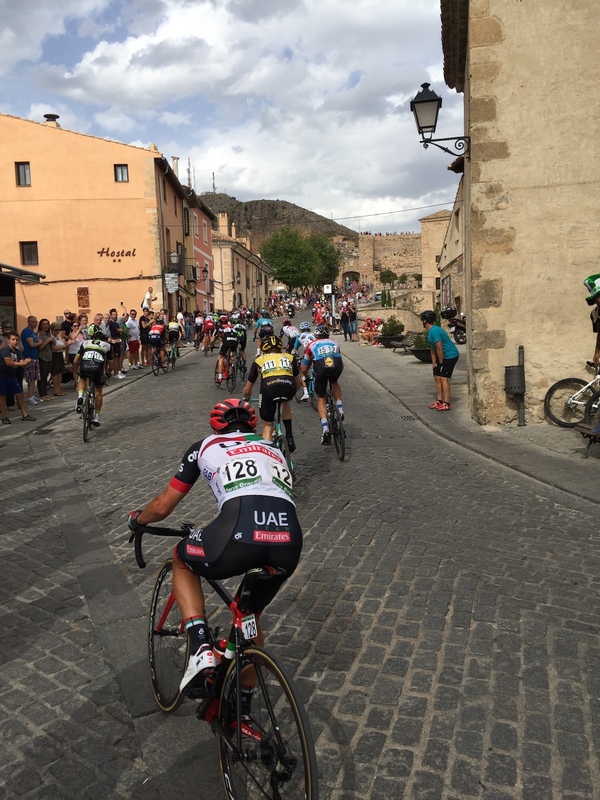 The old town and its historic landmarks ensure a picturesque backdrop to a stage of the tour. 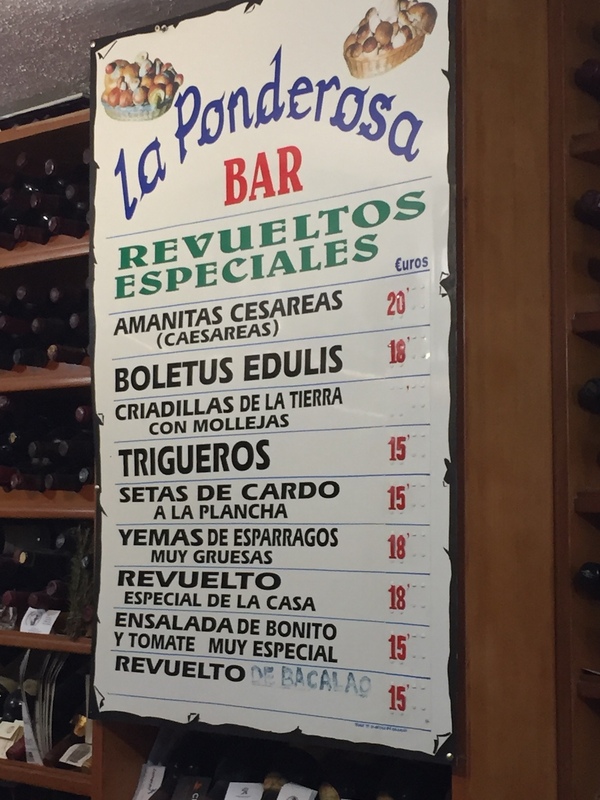 The region has a number of traditional dishes to sample whilst you are visiting; such as Morteruelo (game paté), Zarajos (tripe), and Ajoarriero (cod & puree of potatoes). Lamb dishes are also prevalent in restaurants in Cuenca. The famous Manchego cheese originates from Castile La Mancha and good quality products can be bought in any number of local speciality shops in the city. Cuenca boasts a wide range of different types of restaurants and tapas bars., both tradicional and modern in style. El Gallo Gastrobar newly opened in the summer of 2017. It is located on the corner of Calle Fray Luis de León. The bar offers very nice, modern pintxos with a caña for €1.50. Located on Calle Alfonso VIII, this restaurant offers a modern take on local cuisine. The interior design is interesting and the food good. Casa Marlo (https://cateringmarlo.es). Outside of the old town on Calle Colón, this restaurant and tapas bar is popular with locals. The menu has a range of tapas and ranciones, combining local delicacies with an international influence. The proprietor and chef was featured on Top Chef, a Spanish TV programme. La Ponderosa (https://www.facebook.com/LaPonderosadeCuenca/), Calle San Francisco. The tapas bar is nationally renowned and is extremely busy. There are no tables, it is a case of perching at the bar with a drink and your favourite tapas selection. The only real criticism could perhaps be it is a little on the pricey side. We tried a section of dishes and everything was good. This modern bar and restaurant offers an excellent menu with Asian influences throughout in extremely pleasant surroundings. After dinner there are no shortage of bars and terraces to enjoy a drink. Some of our favourites are Taberna Jovi (https://www.facebook.com/TabernaJovi) on Calle Colmillo, an English pub inspired interior with a good range of cocktails, La Edad de Oro (https://www.facebook.com/laedad.deoro.3/) has a terrace on the Plaza Mayor and live music in the bar, Los Clasicos (https://www.facebook.com/publosclasicos) is another bar off the Plaza Mayor. Vaya Vaya (https://www.facebook.com/vayavaya.cuenca/) Plaza Mayor. You will find a great terrace on Bajada San Miguel beneath Plaza Mayor. You can enjoy a drink and views out over the gorge. You may not find the time for shopping due to passing time visiting the sights of Cuenca, but if you want to shop, you will find the main stores in the new part of the city. The old town is littered with smaller, independent shops, many of which offer local produce. There is a choice of accommodation ranging from the modern hotel chains to hostels and private apartments. At the top of the budget range, the Parador (http://www.parador.es/en/paradores/parador-de-cuenca) is located in the old convent. The rooms are traditional and even the standard doubles are of reasonable size. The real draw is simply staying in such a historic building. The NH Cuenca (https://www.nh-hoteles.es/hotel/nh-ciudad-de-cuenca) is a modern, funcional hotel and offers competitive rates. If you prefer to stay in the old town and don´t mind rustic, then the Hotel Convento del Giraldo is worth considering (http://www.hotelconventodelgiraldo.com/en/). 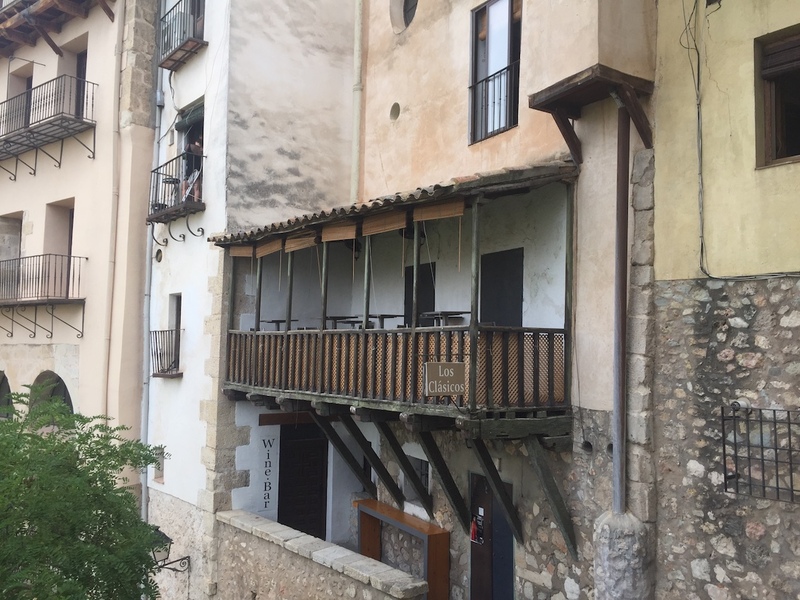 Thanks to websites such as AirBnb, there is a good selection of apartments to rent throughout Cuenca. This is often a better option for families. 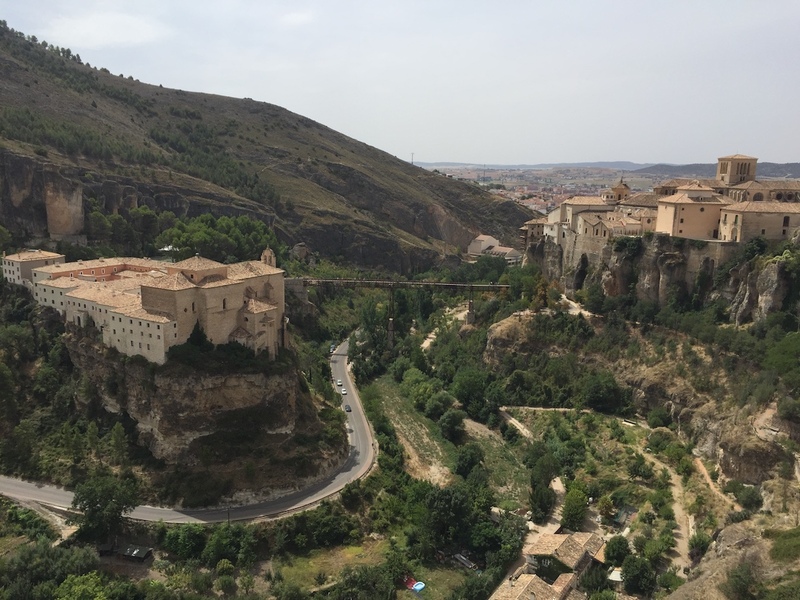 Cuenca is located approximately halfway between Valencia and Madrid. The nearest airports are Madrid (1hr 45 min), Valencia (2 hrs) and Alicante – Elche (3 hr 15 mins). The majority of visitors arrive by car or train. Both Madrid and Valencia are easily accessible by motorway and are around 2 hours drive. Cuenca now benefits from a high speed rail link, the Ave. This rail service links Cuenca with Madrid, Valencia, Albacete and Alicante.